Tonight (Thursday, January 13), Borders will be hosting a Family Game Night in locations across the country. It's a great move to bring families -- most of whom wouldn't have any exposure to hobby games otherwise -- and games together. In addition to the sort of word and card games you'd expect to see, we've mobilized the MIBs to show off Zombie Dice. Look for the festivities to start around 6pm, but call your local store first; not everyone was lucky enough to run a Game Night! If you're in Austin, you have three options for Borders gaming-goodness. Ryan will be covering the location in Southpark Meadows. (I can remember when that area was an open field where concerts were held. I saw Blues Traveller there once!) Will and/or Andrew -- they're still arm-wrestling over who will run the in-house playtest and who will attend the Game Night -- will cover the Borders on South Lamar. Jimmie and I will be in the Domain location, way up north. 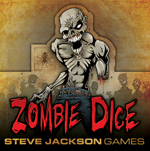 We'll all be happy to teach you Zombie Dice, and answer any questions about other upcoming releases!